I’ve been a die-hard horror fan for most of my life, and the film that first got me hooked on the genre, when I was about eight, was a 1958 B-movie called It! The Terror From Beyond Space. It was about a spaceship that gets boarded by a vicious alien in the form of a guy in a rubber suit with a zipper down the back, but it scared the crap out of me. As cheesy as It! was, it still became one of the prime influences for Ridley Scott’s excellent Alien—and a raft of other, not so swift, creature-in-space flicks. Because of the transcendent effect of my early sci-fi/horror viewing, I’m still a sucker for most of those films, and when I saw the teaser ads for Event Horizon, I was hooked. An endangered spaceship? Dead bodies floating around? Bring on the monster! There is no monster in Event Horizon. But the good news is that it’s still a very scary, well-made, and engrossing film that should appeal to anyone who’s had enough of tongue-in-cheek sci-fi thrillers like Independence Day, Mars Attacks!, and Men in Black. The overall tone of Event Horizon is very dark, like a black hole. This one’s definitely not for eight-year-olds. Set in 2047, the film concerns a mission to salvage the Event Horizon, a prototype spacecraft that’s been missing for the past seven years. The seven-person rescue force is led by a no-nonsense captain, played by the always impressive Laurence Fishburne, and joined by the brilliant but troubled scientist who designed the craft (Sam Neill). 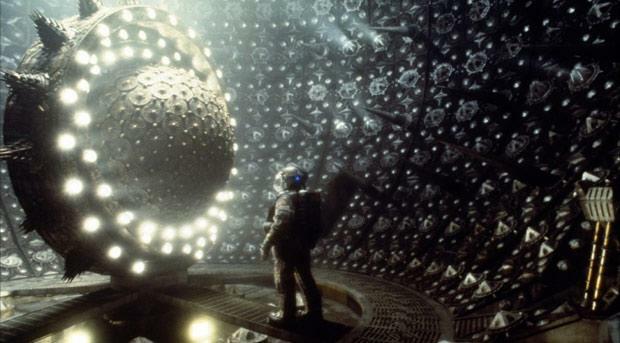 As described by some technical mumbo-jumbo that puts the fi into sci-fi, the Event Horizon has been outfitted with a revolutionary “gravity drive” engineering process that allows it to travel faster than the speed of light. Unfortunately for its deceased crew—seen ripping each other apart on a video log—it also wound up in another dimension, a place of “pure evil”. Now the spaceship itself is possessed, and the would-be rescuers are forced to confront their greatest fears in all manner of gruesome visions and horrendous assaults. What saves Event Horizon from becoming some hokey Amityville Horror in space is the realistic performances of the cast—including Joely Richardson (Vanessa Redgrave’s daughter) and Apollo 13’s Kathleen Quinlan—and the strong element of psychological horror built into the script by first-time screenwriter Philip Eisner. Director Paul Anderson (Mortal Kombat) knows precisely when to insert action elements to beef up the film’s terror quotient, and its atmospheric art direction and meticulous production design—which is on a par with that of the great-looking Alien films—makes the spooks-in-space idea frighteningly believable. Eschewing the predictable plotting and happy endings of recent big-budget sci-fi productions, Event Horizon emerges as a truly twisted, nightmarish summer shocker.